Info "Your fighter needs a balloon!" Balloon Fight is one of 9-Volt's microgames in WarioWare: Twisted! 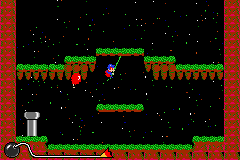 It is based upon the game on the NES with the same name. The purpose of the game is to tilt the Game Boy Advance to get the balloon to the fighter. 1st level difficulty: There are few obstacles in the way. 2nd level difficulty: There are platforms in the way. 3rd level difficulty: There are many obstacles in the way. This page was last edited on September 27, 2018, at 18:41.